In case you missed it - Santorini is limiting visitors in 2019! The magical and beautiful island of Santorini, Greece will be limiting tourists to the island in 2019. That is seriously unfortunate, as Santorini is nearly on every persons bucket list in the world and is often known as having some of the world’s best sunsets. And while the summer season is the busiest and warmest time of the year (Avg. temps in July and August routinely reach over 90 degrees Fahrenheit / 32 C), the island gets more than half of its two million tourists in June, July and August alone…..that’s a lot of people. Additionally, the Wall Street Journal was reporting that on some days during the summer months, more than 18,000 visitors per day roamed the city streets of Santorini. An island that is only 73 square kilometers and only 28 square miles. That’s more than the entire population of the island! As of 2011 (the last census taken on the island) there were only 15,500 residents. That is crazy….I mean, imagine living there and there and you see more tourists than residents! With Santorini being Greece’s most popular island some residents claim all of the foot traffic, swimming and traversing of the island is wrecking some of the history, ecology and even footpaths built into the side of the island. Causing alarm among residents who cannot fix things as fast as they are being destroyed. Not to mention the island’s port is being overrun with too many cruise ships. Large, massive ships can’t even dock in Santorini, yet still sail around the magical island or will anchor just outside the harbor to get a nice view of the sunset. All of which is causing some severe frustrations for local residents. But, even on some days in the summer, the island appeared to be just fine….like this incredible photo we took on our Greece trip in 2018. What will happen in 2019? So, whether or not the island is being overrun by tourists or is actually just fine, beginning 2019, the island will cap cruise arrivals at 8,000, hoping to curb a flow of day travelers the Mayor said, which is putting too much strain on infrastructure and supplies. Meaning, not enough people are staffed to handle all of the cruise ships, not enough hotels are open, and not enough restaurants are able to feed a daily influx of 18,000 people. The move has caused a negative reaction from cruise operators and business owners who say this move would affect their economic situation and that the island to do more to accommodate the crowds, like open more businesses and work longer hours and to provide more accommodations for interested travelers. “The electricity grid and water supply are at their limit. Garbage has doubled in five years, if we don’t control the crowds it will backfire,” Mr. Zoros said. 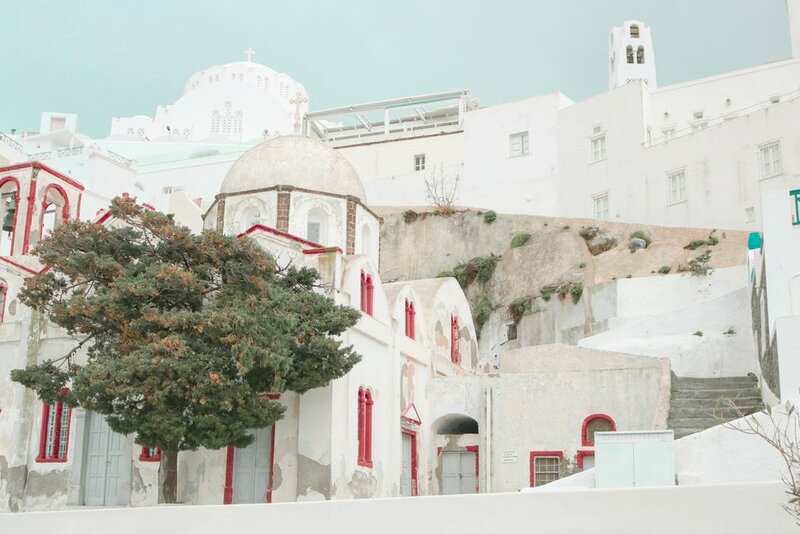 We all know Santorini is a beautiful island, but there is a clear dilemma here. The Mayor, who represents the people, feels as if the island is being victimized by the sheer amount of tourists coming to its shores. But, the tourists are benefitting the islands economy by bringing hundreds, if not millions of dollars to the local businesses and tour operators there, so what’s to be done? In short, people will never stop visiting Santorini. Whether it’s limited to 8,000 people a day or 800, people will still flock to see the world’s best sunset in Oia and will want to bask in the warm afterglow of those late summer nights while sipping on a cocktail. Santorini itself has too much to offer. The locals are so nice and there is so much to do! From hiking, ATV’ing, swimming, snorkeling or going on a sunset catamaran cruise, there is never a dull moment on the island. Even if you think 18,000 people is a lot for one tiny island, there is always room to find a breath of fresh air. Atop Santorini with Al in September 2018. Whether or not you side with the Greeks on this one, one question persists…social media’s ability to uncover, discover and unravel a plethora of ‘secret’ destinations and put them on the map is insane. Is any place truly safe from being the next Santorini? Let us know what you think of this debacle and be sure to comment down below as a guest! We’d love to hear your thoughts! Be sure to check out the images of the tour down below as well as the recap video. Check out our upcoming Greece 2019 tour here and email me personally with any questions, comments or concerns to: cam@voyedgerx.com. If Santorini is limiting visitors this year, you might as well go now, right? Read about the history of Meteora and why you need to visit this mystic destination! The Greek island of Santorini is limiting visitors in 2019 and here’s what you need to know. Nolan takes us on the historic journey and story of The Acropolis, The Birthplace of Athens. Find out some insights about our Greece trip from our staff photographer and guide, Sasha! Nolan is back from two legendary weeks in Greece and the three are finally reunited to talk about all the Hellas amazing things about VRX's 2018 and 2019 trips to the land of white houses, blue roofs, and Mythos beer. Need some help on figuring out what to pack for Greece? We got you covered in our latest blog. Have something to add? Leave us a comment down below! Looking for the top 100 things to do in Greece? Jenreviews.com put together an amazing list you should check out specifically designed for VoyEdge RX. Read more in the blog and let us know what you think in a comment. Three More Reasons To Go To Greece! Looking for three EPIC reasons to make Greece your next destination? We got you covered, click to read more. Meteora, Greece is a UNESCO World Heritage site under two different categories, and these monasteries in the sky NEED to be on your bucket list. See the details on our 'Black Friday' sale and get after it! 10 days, 9 nights through our Greece tour happening in late summer 2018. Trip dates are: August 31st, 2018 to September 9th, 2018 so you can minimize the number of days you have to take off...don't worry guys, we got you covered. Read more in the post. Next Big Trip Release - Island Hopping in Greece! As an adventure travel company, we're always focused on crafting the best itineraries full of hidden gems....and loads of people have been to Greece, but what about off the beaten path? Here's a sneak peek at our upcoming 9 day tour through the rural, lesser-known parts of Greece. How Travel & Fitness Changed My Life. Take A Chance, Empty The Tank. Well here goes the initial blog post of Tony Beringer. Now what to talk about huh? My heart says to get a little personal on this one for plenty of reasons but I won’t bore you with too much of that. I will just hop right into it as I do get a bit long winded when writing. This will be a numbered list and my goal is to keep it short, funny, and informative of not only what I want to accomplish as a co-founder of the company VoyEdge RX but also what I hope to accomplish as a person in the near and much distant future. Strap in as this could possibly be a riveting experience. Who We Are And Why We Started This. An inside look into the thought process of VoyEdge RX's humble beginnings as an adventure travel company based in Boston, MA focused on dropping into CrossFit affiliates around the country and beyond.